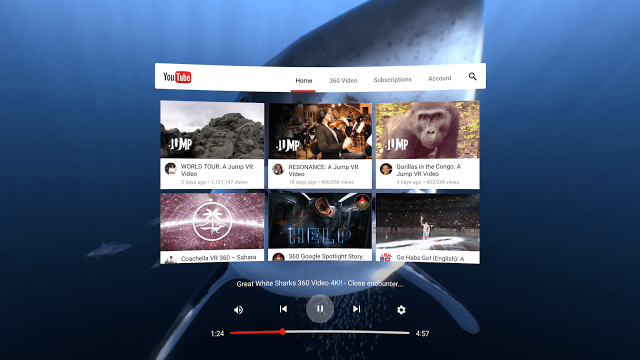 Last year, YouTube announced support for 360º/Virtual Reality video on desktop, mobile and the Google Cardboard viewer. It has become a popular format for creators and the $16 Cardboard headset is now more ubiquitous than any of its competitors. To keep the VR ball rolling, Google recently announced their new, high-quality platform appropriately dubbed “Daydream,” coming out this Fall. The kit will run exclusively on the new Android N operating system and will only be compatible with certain Daydream-ready smartphones yet to be released from partners like Samsung and LG. YouTube also shared plans to create a dedicated VR app for Daydream, and is already collaborating with Buzzfeed, Tastemade and the NBA on exclusive content. The app aims to be your destination for all VR, 360º and Spatial Audio content on the platform. Whether you want to sit front row at your favorite concert, witness the great wonders of the world or take a quick break from your usual YouTube routine, the new VR app will have it all. Several other high-end systems, like the Oculus Rift and Samsung Gear VR, have already been released and will likely map out the key consumer trends to follow. Competition is heavy and the technology remains largely unexplored, but it’s clear that Google wants to be the first to create a uniquely accessible and unparalleled immersive experience for the everyday user. For inspiration on how you can use VR capture technology with your channel, check out this great example from The London Symphony Orchestra.